Q. How do you take screen shots of articles and then post them on Twitter, with sections highlighted and the URL of the article included? A. Annotating screen shots of text passages — and then posting the image and a link to the article on Twitter — is an effective way to make a point with the selected text. It also lets you get around the service’s 140-character limit. You can mark up the screen shot’s text in a few different ways on a mobile device or computer. You can post annotated text images to Twitter after highlighting a passage manually, as at left, or with apps, like OneShot for iOS, that let you stylize your screen shot attachments. 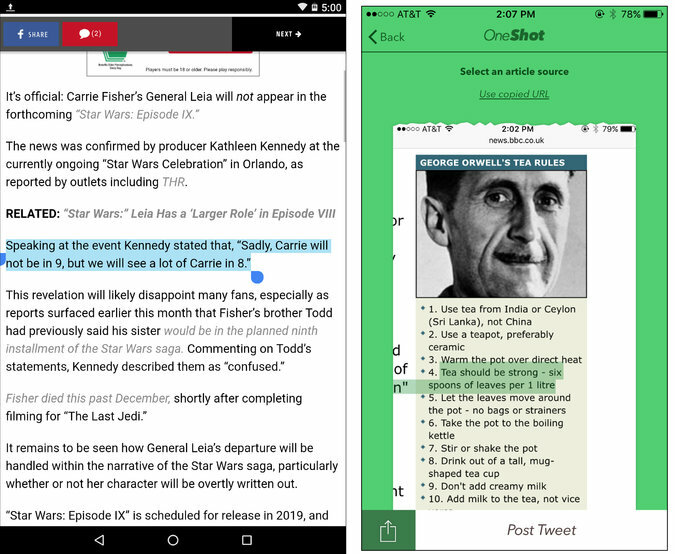 On a mobile device, one basic-but-cumbersome way to share an annotated screen shot is to tap the screen and highlight the part you would like to emphasize by dragging your finger over the passage. When you have it looking the way you want, take the screen shot by pressing the power and home buttons (or whatever method works for your device). Copy and paste the page’s URL into a new Twitter post, add your own explanatory text, tap the camera icon to select the marked-up screen shot you just snapped — and post the message. While this method is free, it does take several steps, and you may have to gently nudge the screen to make the Cut-Copy-Paste toolbar disappear for a second so you can take a less cluttered shot. If you prefer to streamline the screen shot-markup process, look for an app that lets you annotate images so you can add your highlights before you post the screen shot; plenty of image-editing apps are available. Twitter-specific apps are out there, too, like Xcerpt for Android and OneShot for iOS. With a specialized app you can selectively call out text passages, or crop the screen images and highlight them in a wide palette of colors before posting the image with a reference link. If you are using Twitter with a desktop browser, highlight the text passage with the cursor and take a screen shot using the standard Windows and Mac keyboard shortcuts. Once you have the image you want, you can compose the post, paste in the URL and attach the screen shot. You can add more detailed annotations like arrows and boxes with the desktop utilities that come with your system — the Snipping Tool in Windows and the Preview app on the Mac. Just as there are mobile apps to simplify things, check your browser’s add-on store for markup tools. Open Screenshot, Capture, Explain and Send, and Screenshot Webpages are three such extensions for Google Chrome, and Awesome Screenshot Plus is among the add-ons for Firefox. Microsoft Edge includes its own markup tools. And the site you are using may even help you out: Medium.com is one that creates a screen shot for you to post on Twitter when you highlight a text passage.